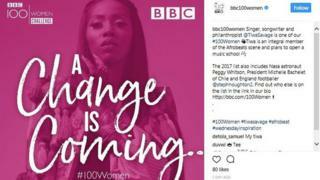 Nigerian singer, Tiwa Savage name come out on top BBC 100 Most Inspirational and Innovative Women list. 100 Women na BBC multi-format series wey dey look di kind role women dey play inside di 21st century since 2013. Apart from Tiwa, Liberian president Ellen Johnson Sirleaf and six other Africans show for di list. Na so Tiwa Sawage belle sweet so tey she carry di joy enter social media. Dis year 2017, di BBC 100 women go last for one week and e go include broadcast, online reports, debates and journalism for topic wey concern women. 100 Women: Women fit change dis world inside one week?